Bigger is better and the Strike King KVD Mega Dawg does not disappoint. 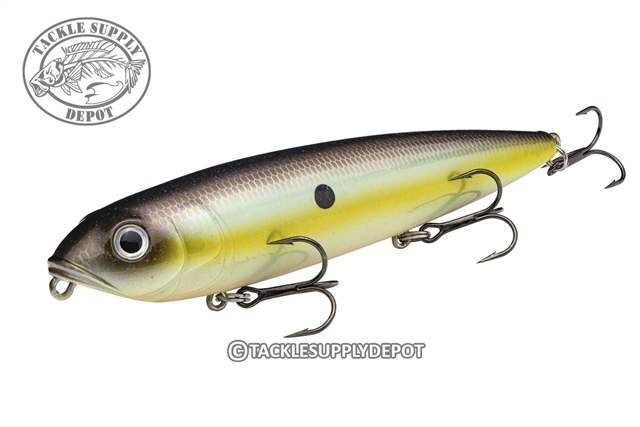 This topwater is large, in charge and the perfect crossover for anglers that are targeting bass, pike, stripers as well as bluefish. When going after big predators sometimes a big prey is just what they want. The super-sized Strike King KVD Mega Dawg measures in at the 6in mark and is just under 2 ounces. A streamline body design allows for a walk the dog action that calls up bone crushing blows from below. Featuring a precisely weighted body that is fitted with a loud rattle chamber which makes noise like a dinner bell to all in the area. When everyone is throwing the small finesse top waters and only getting a bite here and there try giving the fish just to opposite and hold on.